I know… I haven’t posted anything in two months! The fact of the matter is that I have been occupied with things other than painting, some quite wonderful and others rather burdensome. Since the burdensome stuff has to do with mountains of paperwork, I shan’t say another thing about it. Enough already! I have three of my Mandalas & Meditations paintings in the 49th Anniversary show at the Gallery on the Green. Each painting is 10″ x 10″ x 1″ – acrylic and mixed media on wood. From left to right: Shine Within, Listen and Be Present. The show runs from May 22 through June 21. 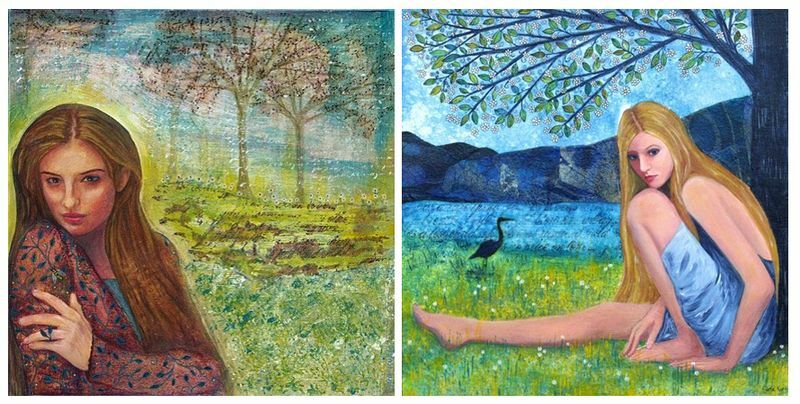 These two paintings, Bee’s Wing (which is featured in Susan Tuttle’s fabulous Book, Exhibiton 36) and Asphodel (both 12″ x 12″ x 1″ acrylic and mixed media on wood) are in Artwell Gallery’s Square Foot show, opening May 30 and running through July 21. 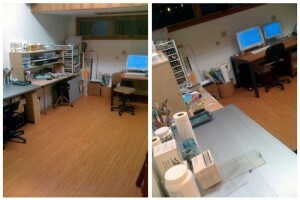 I have pretty much completed the first phase of my studio project and am ready to start getting creative again. 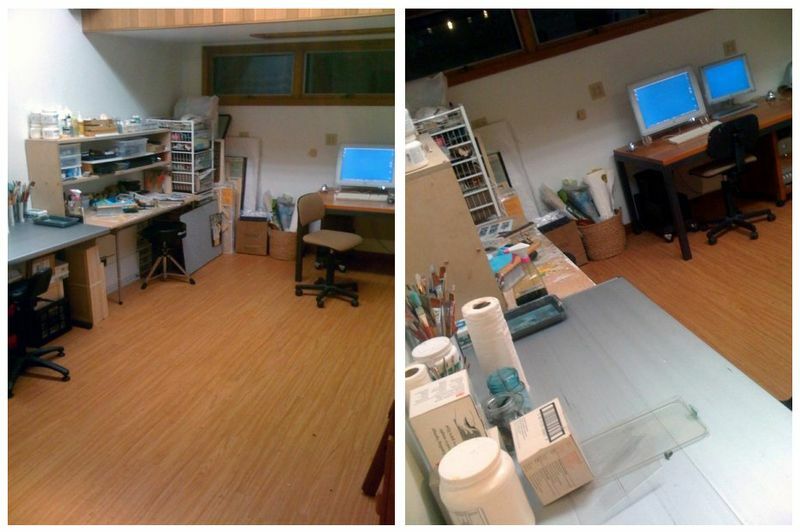 It’s a beautiful space, and I want to thank my dear husband Jol for making it all possible… clearing out his “stuff,” putting it new lighting and flooring and helping me move the masses of art supplies and furniture from the house down the hill to the new studio. Below are some shots of Ethan and Jol removing the old carpet and installing the new floor. And finally, the pictures below show that everything is somewhat organized. The studio is now functional, but I want to get new furniture and decorate the space so it’s beautiful and inspiring rather than simply utilitarian. Jol’s shop is right next door in the same building, so I’m looking forward to hours of time spent together in our own little worlds! Last, but certainly not least… After spending a very inspiring weekend (April 17 – 19) in a SoulCollage® Faciliator Training Workshop run by Anne Marie Bennet and Jean Marie Merkel at Wisdom House in Litchfield, CT, I am now a SoulCollage® facilator. Starting in July, I will be offering live SoulCollage and art workshops in my studio. I’m also planning other events and workshops that I can share with those of you who aren’t in my local area. In the meantime, I invite you to visit my Wings 4 You Coaching blog where I am hosting a SoulCollage® Discovery Circle. It’s never too late to join as this is an ongoing group. And now, before the day gets too old, I’m going to get outside and enjoy the sun!